Hou Jusen, a Chinese teen from Shandong Province's Weihai city, recently picked a quarrel with another teenager online. The two boys fixed a date to settle the score in person and on July 22, along with their friends, they fought in front of a college in the city. The incident was most likely just an ordinary street fight, as the city's police officers concluded in a message published on popular social media site Weibo. But Hou is not just any teen — he is an online “civilization volunteer”, a young person recruited and rewarded in exchange for posting pro-government and pro-Communist party comments online. Soon after the skirmish, members of the China Communist Youth League portrayed it as something ideological — a “patriotic youth” injured by an unidentified mob for expressing his love of country. Since February 2015, the China Communist Youth League has recruited approximately 18 million civilization volunteers to “spread positive energy” online. The organization of the volunteers is in a form of hierarchical network lead by the party which analyzes public opinion and gives guidelines to network members who orchestrate the party's view. Huo had participated in an “online propaganda training” organized by the Shandong branch of the Communist Youth League from June 29 to July 2. Online, Hou's peers from the civilization army swore to root out enemies in revenge, while those who oppose the policing of Internet comments under the pretext of “patriotism” ridiculed Hou and his comrades, saying that they deserved to be beaten up. Many expressed worry that similar incidents will recur and that the online battle will eventually spill over into physical conflict, similar to what happened during the Chinese Cultural Revolution half a century ago. The bunch of debased maggots, five to six of them beat me with pepper water and rod. If you have the guts, don't run away, you wall-climbing gang are processed by devil. You are too naive to believe that you can beat me down with this. The term “wall-climbing gang” refers to those who use circumvention tools to get around China's Great Firewall of domestic Internet censorship and access foreign websites. The message thus hinted that the fight is political in nature. 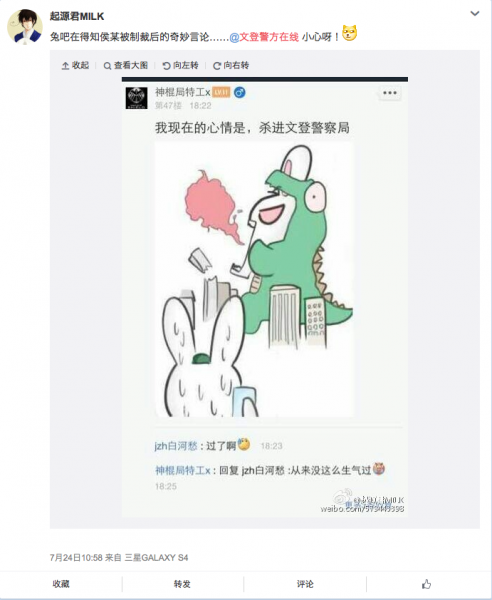 The message was re-posted more than 6,000 times, and the Central Communist Youth League also urged the public to pay attention to the incident in their official Weibo. In response to public concern: Wendeng district police are following the case. At 13:30 p.m. July 22, a disturbance took place outside the gate of Normal College at Wendeng district of Weihai city. After the case was reported, Wendeng police started an investigation. The initial finding: Hou had some disputes with others online, they picked a time to meet outside the school gate and came to blows. Public security authorities will continue to follow the case. Usually in cases related to public disputes, both parties are placed in administrative detention. On July 24, Wendeng district police closed the case by ordering six individuals to spend seven to 15 days in detention; Hou was detained for 10 days. The police investigation triggered another round of debate. As a national organization, the role of public security authorities is not only to crack down on crime, but also to defend national security, honor and interest. […] If someone was attacked because of his patriotic speech, this is not a public disturbance, this is a criminal case! […] according to your logic, the anti-Japanese war should be called a fight between China and Japan. Even if the Japanese bullied us and invaded our home, we should not fight back? The Central Communist Youth League doubled down on that line of thinking in their Internet Opinion report published on July 25. The report criticizes the Wendeng police for not being sensitive enough when handling the case and also suggests there may have been “foreign forces” behind the street fight. Some netizens were not convinced by the claims that Hou was completely innocent. They dug up Hou's online history on various social media platforms, which showed he has a history of picking quarrels online and using sexual foul language. 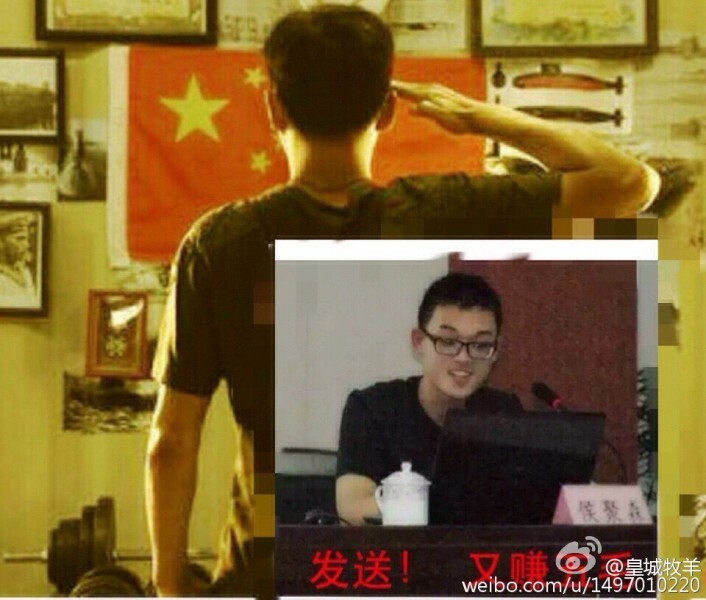 Many criticized the Communist Youth League, accusing them of using patriotism as shelter for thugs or online bullies. There is no love. They just pick quarrels and fights all day long. Today vow to execute this and tomorrow execute someone else. This is not love but hatred. Such patriotism is not loving one's country but hating one's country. History has proven that ideological struggle is similar to class struggle. The result is not love, but harm to the country. […] When handling online opinion, instead of inviting experts and professors to engage in rational talk and pass on knowledge and truth, we seduce students who are naive and launch verbal and personal attacks on public intellectuals. Is this patriotic education? Or a cultivation of thugs?